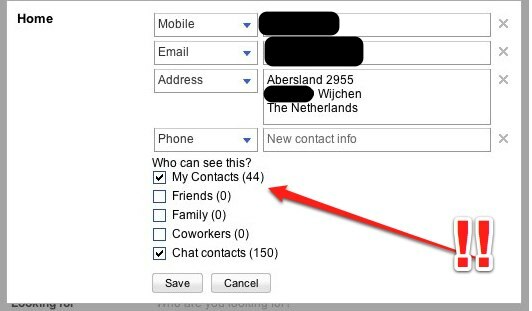 Update: The address shown in the SERPS is probably shown within your social circle (see below). It is becoming more than a day job to keep track of all the changes Google makes to their SERPS. We therefore sometimes try to update you with the latest developments in the SERPS. Today again three changes which Google made to the SERPS: you in some cases can edit your Google Profile straight from the SERPS and Google has made some changes to the autocomplete feature, making it also work on word-by-word. Most remarkable however is your address showing up in the SERPS. 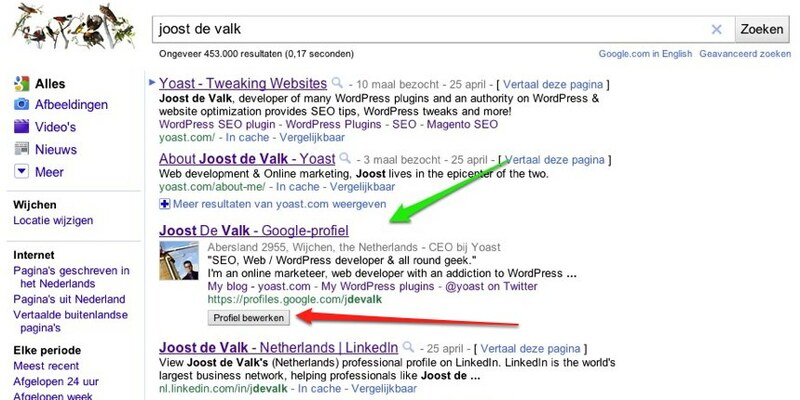 If you look at Joost’s results you can see that at his Google Profile result a button is added: “Profiel bewerken“, which is Dutch for “edit profile”. Jost is logged in off course, but now has the option to immediately start editing his profile. I am not seeing this myself but my guess is we will be seeing more of this very soon. Note that this is also visible for others, if I do a search for Joost’s name, I see the address popping up. This feature is currently rolling out to all users on google.com in English. Nice post – I think it’s important for Google Profiles to show up higher in search results than they do currently, if Google want this to kick off. Have to remember that Profiles are tied in with the +1 system soon to be released, so both have to be highly visible in order to take off and therefore work. That aside, my thoughts on the privacy issue of showing an address in a search result: it’s just a quicker and easier way of finding out the information which is available anyway. All someone would have to do is click through to your profile to find out the info anyway – so if you don’t want it available, don’t put it there. What is interesting about this, is that it appears to be using the same XFN attributes and social graph API data that predicates social circle results. What I mean by this, is that I can still see Joost address when I am logged in – even though we’re not direct connections via Google. However we both have G profiles with our additional XFN marked-up profiles (probably twitter in this case), therefore we’re 2nd degree connections; which Google decides is cool enough for me to show that data. I know this is something that myself and Nicola have been looking at for a couple of months now and I do hope to go into more details about what I have found very soon. XFN is starting to show itself more and more in our SERP`s for no other reason in my opinion beyond Google using your profile as its base to seed what I think will become their SM platform. I have had a profile for a number of years like many of us and in older versions than the one I have now, I have included links to all kinds of profiles I have had across the web. (Quora, LinkedIn, Youtube etc) everything that Google is sitting up to take notice of that utilizes XFN markup. Some more than others it seems, but controlling that is not as easy as I thought it would be. Your Google profile is very quick to update in the SERP`s after edit, it’s the Social Connections that we control that seem to take an age. I will get back to you with my findings sooner (hopefully) rather than later. @Dean – funnily enough you were one of the other people I searched for to test this theory; already knowing from previous conversations that we’re not “direct” connections, but 2nd degree, so to speak. Sure enough I get a line of data in the address field. Everthing we were discussing is pointing in the direction we suspect. Taming that beast though will offer an advantage, albeit small in the grand scheme of things. If this does evolve the way we are suspecting it to, understanding it has to be a priority. I always wondered if those search results were customised because my friend gets different results from me if we search the exact keywords. interesting.